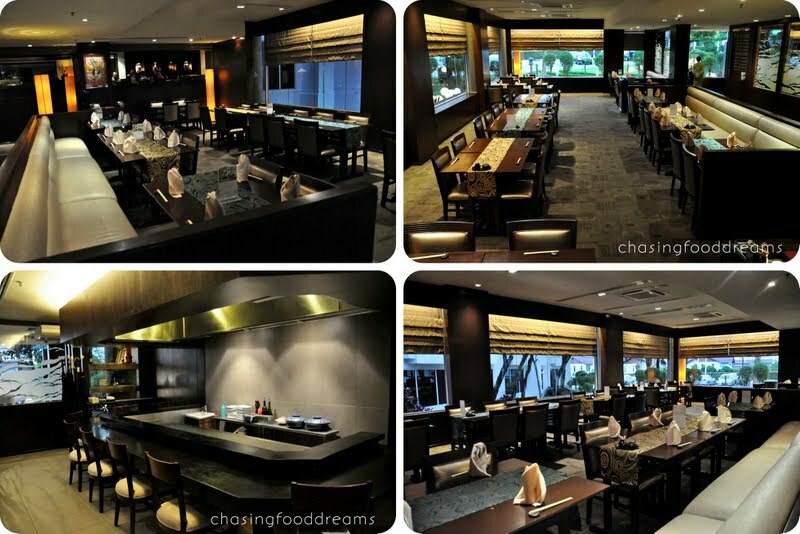 CHASING FOOD DREAMS: Fu-Rin Japanese Restaurant, Holiday Inn Kuala Lumpur Glenmarie: Be My Valentine! Fu-Rin Japanese Restaurant, Holiday Inn Kuala Lumpur Glenmarie: Be My Valentine! Romance is also Around the Corner! Taking a break from all the CNY festivity, let’s also not forget that romance is in the air in the month of February! Let’s wine and dine your loved ones this coming Valentine’s Day with a Japanese candlelight set dinner at Fu-Rin Japanese Restaurant at Holiday Inn Kuala Lumpur Glenmarie. Romance your loved ones in the tranquil ambience of Fu-Rin for an evening of sweet and delicious Japanese cuisine. Fu-Rin, an award winning Japanese restaurant, is helmed by Chef Yip Wei Mun. With his vast culinary experience and several awards, Chef Yip will whipped up a delectable treat of sumptuous Japanese cuisine to win the hearts… and stomachs of you and your loved ones. Hidden discreetly away from all the bustling commotions of the city, Fu-Rin Japanese Restaurant is beautifully designed with a Zen garden. The interior also evoked a Zen atmosphere with subtle décor in natural colors. Guests are treated to lots of garden green views for more Mother Nature’s touch. Fu-Rin also has a teppanyaki room while private dining rooms are available for private functions. Zensai , our Japanese appetizer to start the loving gourmet journey consisted of a gravity defying 3-piece appetizers of Prawn in two sauces, Tatami Iwashi and Marinated Scallops with Micro Sprouts. Starting off was three chilled scallops marinated with tiny bubbles of fish roes in a light citrus savory flavor. Simply adored the lightly firm and chewy texture with its salty goodness. Tatami Iwashi, resembling a tatami mat, is actually made from lots of dried baby sardines held together like a mat. It has a crispy texture with a light pleasant fish aroma. I thought it was really pretty! Balancing high on a cucumber, the crustacean was doused with two sauces featuring sweet, savory, fruity and a little hint of spicy note. The sauces were so good, I even ate the crunchy cucumber to clean up the sauce! Fancy love names denote this Valentine meal and I definitely fell in love with this dish. Echoing a Carpaccio style, three slices of salmon, white tuna and yellowtail are capped with an array of ingredients and flavors. One gets a lovely bite of the fish with some crunchy tempura flakes, fried leeks, fish roes, crushed pink peppercorn and an aromatic basil sauce. Its distinctive light tangy flavors are simply delicious with lots of umami flavors. I would love more of this ménage a trois… wink! Nameko Akadashi evoked all my comfort senses. Simply hearty and soulful, this red miso soup filled with wakame, bean curd and Shimeji mushrooms are savory, creamy and a little nutty. It’s definitely love in the food department. My love for the omega rich salmon is pretty obvious, especially if the salmon is just cooked to almost done. The Grilled Salmon with Teriyaki maybe a classic but this one is beautifully jazzed up with extra loves of two way asparagus and soft wedges of eggplant. High point lies in the salmon cooked to my perfection. I adored the tempura asparagus and the lemon cream asparagus for their contrasting flavors. Making its Japanese debut was Ao Tosaka, green seaweed served chilled with sesame dressing. Everything just worked beautifully with the luscious sweet salmon, crunchy vegetables and dressing . Green Tea Ice Cream with Adzuki Beans is set to provide much endless love to those celebrating their Valentine at Fu-Rin. Silky luscious green tea with tinges of sweet bitterness does represent love in many ways of sweet bitter moments. Its another classic that never fails to please… unless you are not a fan of green tea. *Psst… you may also want to end your Valentine’s affair with a stay in Holiday Inn Kuala Lumpur Glenmarie to enjoy a romantic evening with your loved one! On another note with the festive Chinese New Year around the corner, Fu-Rin also shares a piece of CNY festivity with its own rendition of Japanese Yee Sang. Available at RM68++ for medium portion and RM48++ for small, this is a gorgeous take on the auspicious Yee Sang. Spiked up with two types of crunchy Japanese seaweed, jelly fish, loads of fresh shredded vegetables, slivers of salmon sashimi and a nutty sesame sauce, everyone raved about this that night. Simply must-have if you feel like something different! Fu-Rin Japanese Restaurant Valentine’s Day Promotion Set Menu is available only on February 14. The Set Dinner starts from RM220++ per set and comes with a glass of sparkling wine, a stalk of rose for the lady and a surprise gift. Terms and conditions apply. For more information and reservation for Fu-Rin Japanese Restaurant, call +603 7802 5200. So what are your plans? Coming here for your Valentine's Day dinner? Wink! Wink! The carpaccio looks great! I think japanese food for Valentine's is very romantic. Looks like a very artistic presentation of the food. I love the Carpaccio the most, with various topping!